Download "Multiple Routing Configurations for Fast IP Network Recovery"
2 2 the recovered traffic is routed. The backup configuration used after a failure is selected based on the failure instance, and thus we can choose link weights in the backup configurations that are well suited for only a subset of failure instances. The rest of this paper is organized as follows. In Sec. II we describe the basic concepts and functionality of MRC. We then define MRC formally and present an algorithm used to create the needed backup configurations in Sec. III. In Sec. IV, we explain how the generated configurations can be used to forward the traffic safely to its destination in case of a failure. We present performance evaluations of the proposed method in Sec. V. In Sec. VI, we discuss how we can improve the recovery traffic distribution if we have an estimate of the demands in the network. In Sec. VII, we discuss related work, and finally we conclude in Sec. VIII. II. MRC OVERVIEW MRC is based on building a small set of backup routing configurations, that are used to route recovered traffic on alternate paths after a failure. The backup configurations differ from the normal routing configuration in that link weights are set so as to avoid routing traffic in certain parts of the network. We observe that if all links attached to a node are given sufficiently high link weights, traffic will never be routed through that node. The failure of that node will then only affect traffic that is sourced at or destined for the node itself. Similarly, to exclude a link (or a group of links) from taking part in the routing, we give it infinite weight. The link can then fail without any consequences for the traffic. Our MRC approach is threefold. First, we create a set of backup configurations, so that every network component is excluded from packet forwarding in one configuration. Second, for each configuration, a standard routing algorithm like OSPF is used to calculate configuration specific shortest paths and create forwarding tables in each router, based on the configurations. The use of a standard routing algorithm guarantees loop-free forwarding within one configuration. Finally, we design a forwarding process that takes advantage of the backup configurations to provide fast recovery from a component failure. In our approach, we construct the backup configurations so that for all links and nodes in the network, there is a configuration where that link or node is not used to forward traffic. Thus, for any single link or node failure, there will exist a configuration that will route the traffic to its destination on a path that avoids the failed element. Also, the backup configurations must be constructed so that all nodes are reachable in all configurations, i.e., there is a valid path with a finite cost between each node pair. Shared Risk Groups can also be protected, by regarding such a group as a single component that must be avoided in a particular configuration. In Sec. III, we formally describe MRC and how to generate configurations that protect every link and node in a network. Using a standard shortest path calculation, each router creates a set of configuration-specific forwarding tables. For simplicity, we say that a packet is forwarded according to a configuration, meaning that it is forwarded using the forwarding table calculated based on that configuration. In this paper we talk about building a separate forwarding table for each configuration, but we believe that more efficient solutions can be found in a practical implementation. When a router detects that a neighbor can no longer be reached through one of its interfaces, it does not immediately inform the rest of the network about the connectivity failure. Instead, packets that would normally be forwarded over the failed interface are marked as belonging to a backup configuration, and forwarded on an alternative interface towards its destination. The selection of the correct backup configuration, and thus also the backup next-hop, is detailed in Sec. IV. The packets must be marked with a configuration identifier, so the routers along the path know which configuration to use. Packet marking is most easily done by using specific values in the DSCP field in the IP header. If this is not possible, other packet marking strategies like IPv6 extension headers or using a private address space and tunneling (as proposed in ) could be used. It is important to stress that MRC does not affect the failurefree original routing, i.e., when there is no failure, all packets are forwarded according to the original configuration, where all link weights are normal. Upon detection of a failure, only traffic reaching the failure will switch configuration. All other traffic is forwarded according to the original configuration as normal. If a failure lasts for more than a specified time interval, a normal re-convergence will be triggered. MRC does not interfere with this convergence process, or make it longer than normal. However, MRC gives continuous packet forwarding during the convergence, and hence makes it easier to use mechanisms that prevents micro-loops during convergence, at the cost of longer convergence times . If a failure is deemed permanent, new configurations must be generated based on the altered topology. III. GENERATING BACKUP CONFIGURATIONS In this section, we will first detail the requirements that must be put on the backup configurations used in MRC. Then, we propose an algorithm that can be used to automatically create such configurations. The algorithm will typically be run once at the initial start-up of the network, and each time a node or link is permanently added or removed. We use the notation shown in Tab. I. 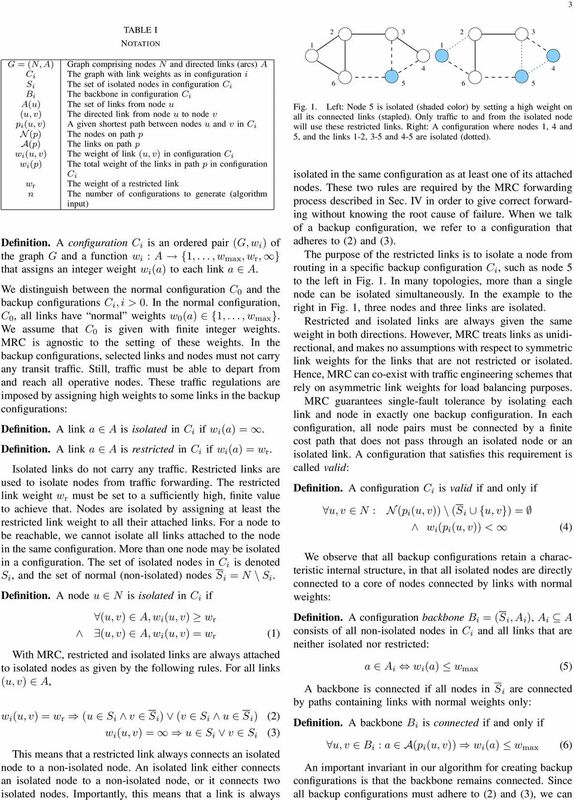 A. Configurations Structure MRC configurations are defined by the network topology, which is the same in all configurations, and the associated link weights, which differ among configurations. We formally represent the network topology as a graph G = (N,A), with a set of nodes N and a set of unidirectional links (arcs) A 1. In order to guarantee single-fault tolerance, the topology graph G must be bi-connected. A configuration is defined by this topology graph and the associated link weight function: 1 We interchangeably use the notations a or (u, v) to denote a link, depending on whether the endpoints of the link are important. 13 13 TABLE III CONCEPTUAL COMPARISON OF DIFFERENT APPROACHES FOR FAST IP RECOVERY Scheme Guaranteed in Node Link Pre- Connec- Failure Last bi-connected faults faults configured tionless agnostic hop MRC yes yes yes yes yes yes yes Not-via tunneling  yes yes yes yes yes yes yes Local rerouting  no no yes no yes N/A N/A FIR  yes no yes yes yes N/A N/A FIFR  yes yes yes yes yes yes no LFA  no yes yes yes yes yes yes MPLS FRR  yes yes yes yes no no N/A Rerouting (OSPF) yes yes yes no yes yes yes used to obtain deadlock-free and fault-tolerant routing in irregular cluster networks based on a routing strategy called Up*/Down* . General packet networks are not hampered by deadlock considerations necessary in interconnection networks, and hence we generalized the concept in a technology independent manner and named it Resilient Routing Layers . In the graph-theoretical context, RRL is based on calculating spanning sub topologies of the network, called layers. Each layer contains all nodes but only a subset of the links in the network. In this paper we refine these ideas and adapt them to an IP setting. None of the proactive recovery mechanisms discussed above take any measures towards a good load distribution in the network in the period when traffic is routed on the recovery paths. Existing work on load distribution in connectionless IGP networks has either focused on the failure free case , , , or on finding link weights that work well both in the normal case and when the routing protocol has converged after a single link failure , , . Many of the approaches listed provide elegant and efficient solutions to fast network recovery, however MRC and Notvia tunneling seems to be the only two covering all evaluated requirements. However, we argue that MRC offers the same functionality with a simpler and more intuitive approach, and leaves more room for optimization with respect to load balancing. VIII. CONCLUSION We have presented Multiple Routing Configurations as an approach to achieve fast recovery in IP networks. MRC is based on providing the routers with additional routing configurations, allowing them to forward packets along routes that avoid a failed component. MRC guarantees recovery from any single node or link failure in an arbitrary bi-connected network. By calculating backup configurations in advance, and operating based on locally available information only, MRC can act promptly after failure discovery. MRC operates without knowing the root cause of failure, i.e., whether the forwarding disruption is caused by a node or link failure. This is achieved by using careful link weight assignment according to the rules we have described. The link weight assignment rules also provide basis for the specification of a forwarding procedure that successfully solves the last hop problem. The performance of the algorithm and the forwarding mechanism has been evaluated using simulations. We have shown that MRC scales well: 3 or 4 backup configurations is typically enough to isolate all links and nodes in our test topologies. 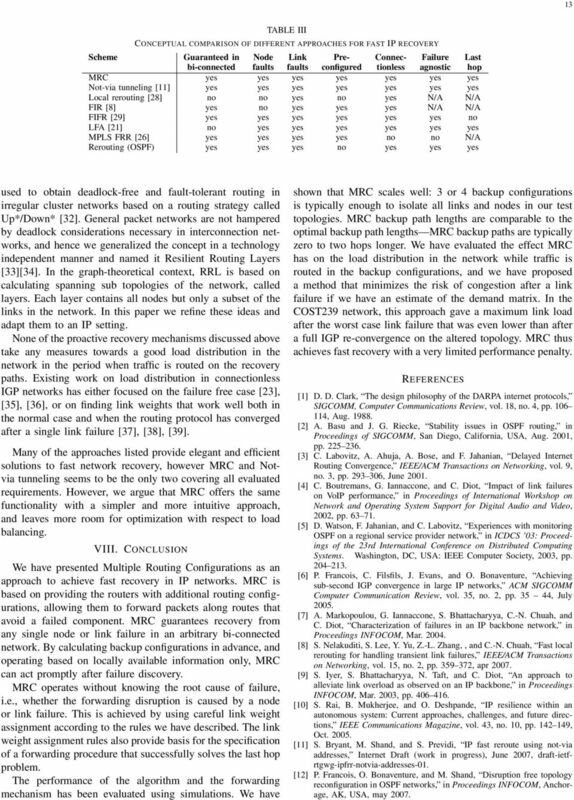 MRC backup path lengths are comparable to the optimal backup path lengths MRC backup paths are typically zero to two hops longer. 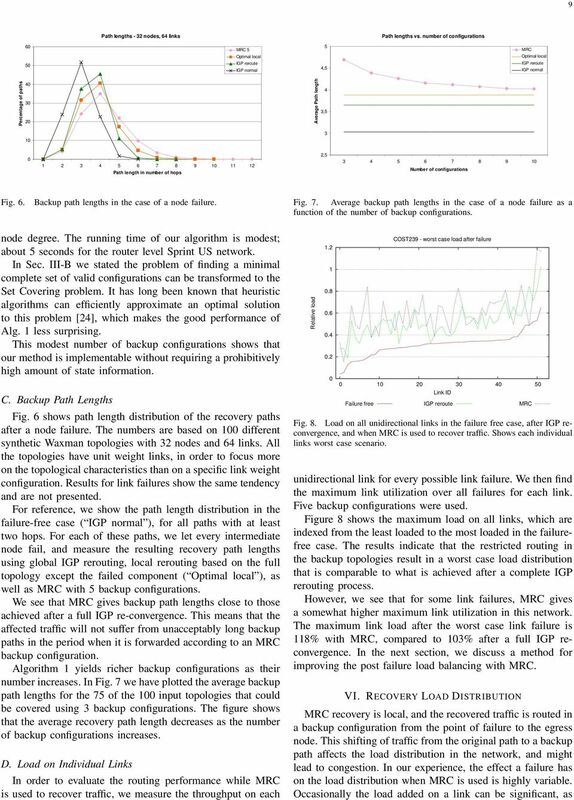 We have evaluated the effect MRC has on the load distribution in the network while traffic is routed in the backup configurations, and we have proposed a method that minimizes the risk of congestion after a link failure if we have an estimate of the demand matrix. In the COST239 network, this approach gave a maximum link load after the worst case link failure that was even lower than after a full IGP re-convergence on the altered topology. MRC thus achieves fast recovery with a very limited performance penalty. 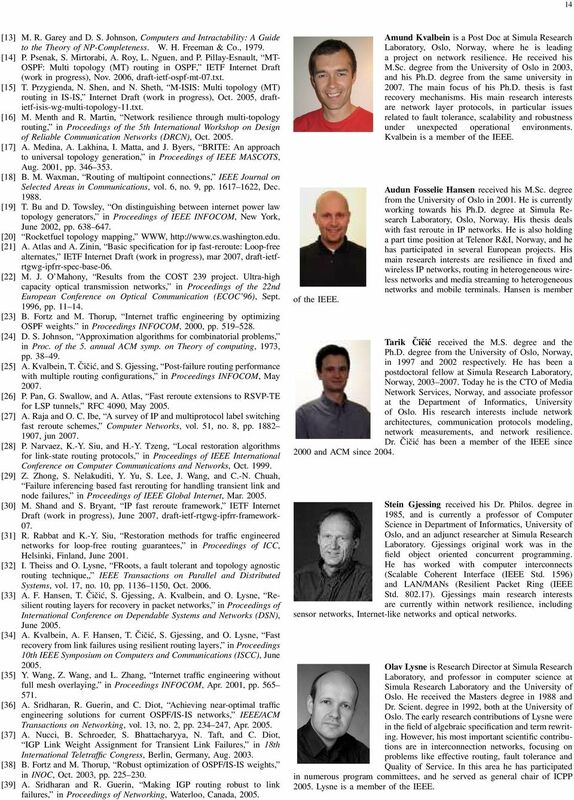 REFERENCES  D. D. Clark, The design philosophy of the DARPA internet protocols, SIGCOMM, Computer Communications Review, vol. 18, no. 4, pp , Aug  A. Basu and J. G. Riecke, Stability issues in OSPF routing, in Proceedings of SIGCOMM, San Diego, California, USA, Aug. 2001, pp  C. Labovitz, A. Ahuja, A. Bose, and F. Jahanian, Delayed Internet Routing Convergence, IEEE/ACM Transactions on Networking, vol. 9, no. 3, pp , June  C. Boutremans, G. Iannaccone, and C. Diot, Impact of link failures on VoIP performance, in Proceedings of International Workshop on Network and Operating System Support for Digital Audio and Video, 2002, pp  D. Watson, F. Jahanian, and C. Labovitz, Experiences with monitoring OSPF on a regional service provider network, in ICDCS 03: Proceedings of the 23rd International Conference on Distributed Computing Systems. Washington, DC, USA: IEEE Computer Society, 2003, pp  P. Francois, C. Filsfils, J. Evans, and O. Bonaventure, Achieving sub-second IGP convergence in large IP networks, ACM SIGCOMM Computer Communication Review, vol. 35, no. 2, pp , July  A. Markopoulou, G. Iannaccone, S. Bhattacharyya, C.-N. Chuah, and C. Diot, Characterization of failures in an IP backbone network, in Proceedings INFOCOM, Mar  S. Nelakuditi, S. Lee, Y. Yu, Z.-L. Zhang,, and C.-N. Chuah, Fast local rerouting for handling transient link failures, IEEE/ACM Transactions on Networking, vol. 15, no. 2, pp , apr  S. Iyer, S. Bhattacharyya, N. Taft, and C. Diot, An approach to alleviate link overload as observed on an IP backbone, in Proceedings INFOCOM, Mar. 2003, pp  S. Rai, B. Mukherjee, and O. Deshpande, IP resilience within an autonomous system: Current approaches, challenges, and future directions, IEEE Communications Magazine, vol. 43, no. 10, pp , Oct  S. Bryant, M. Shand, and S. Previdi, IP fast reroute using not-via addresses, Internet Draft (work in progress), June 2007, draft-ietfrtgwg-ipfrr-notvia-addresses-01. P. Francois, O. Bonaventure, and M. Shand, Disruption free topology reconfiguration in OSPF networks, in Proceedings INFOCOM, Anchorage, AK, USA, may 2007. 14 14  M. R. Garey and D. S. Johnson, Computers and Intractability: A Guide to the Theory of NP-Completeness. W. H. Freeman & Co.,  P. Psenak, S. Mirtorabi, A. Roy, L. Nguen, and P. Pillay-Esnault, MT- OSPF: Multi topology (MT) routing in OSPF, IETF Internet Draft (work in progress), Nov. 2006, draft-ietf-ospf-mt-07.txt. 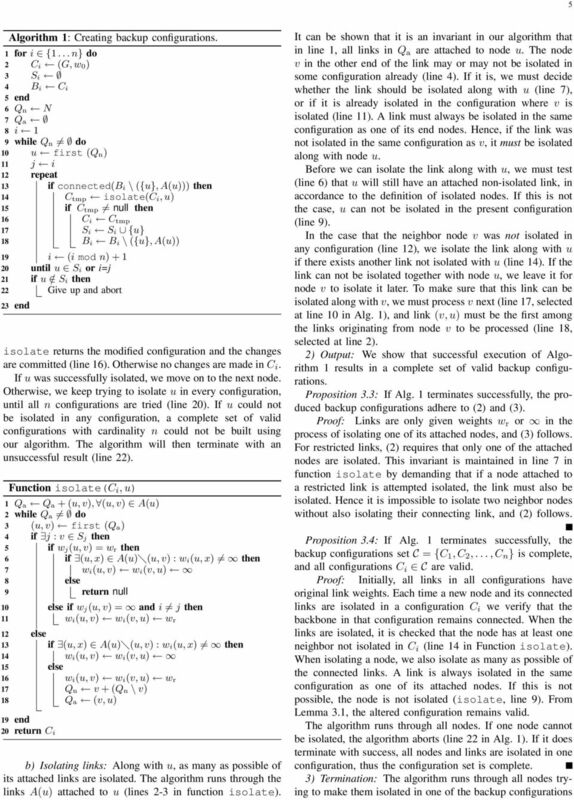 T. Przygienda, N. Shen, and N. Sheth, M-ISIS: Multi topology (MT) routing in IS-IS, Internet Draft (work in progress), Oct. 2005, draftietf-isis-wg-multi-topology-11.txt. M. Menth and R. Martin, Network resilience through multi-topology routing, in Proceedings of the 5th International Workshop on Design of Reliable Communication Networks (DRCN), Oct  A. Medina, A. Lakhina, I. Matta, and J. Byers, BRITE: An approach to universal topology generation, in Proceedings of IEEE MASCOTS, Aug. 2001, pp  B. M. Waxman, Routing of multipoint connections, IEEE Journal on Selected Areas in Communications, vol. 6, no. 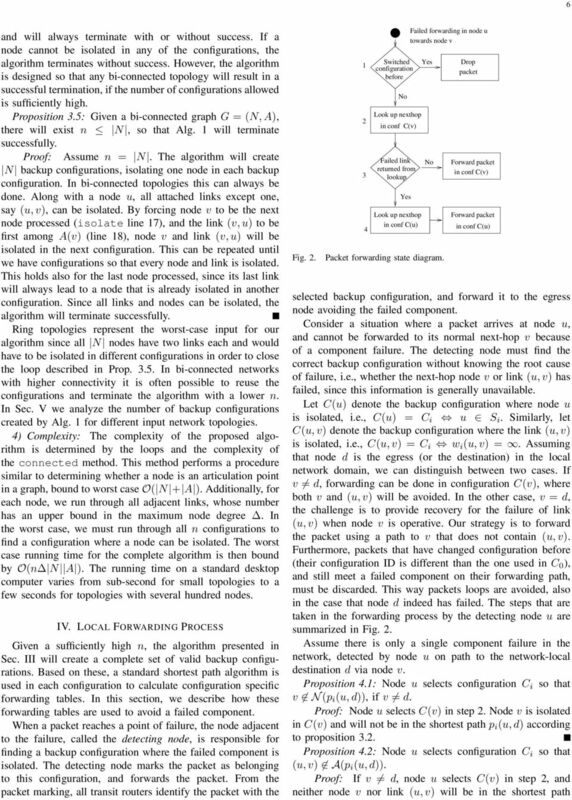 9, pp , Dec  T. Bu and D. Towsley, On distinguishing between internet power law topology generators, in Proceedings of IEEE INFOCOM, New York, June 2002, pp  Rocketfuel topology mapping, WWW,  A. Atlas and A. Zinin, Basic specification for ip fast-reroute: Loop-free alternates, IETF Internet Draft (work in progress), mar 2007, draft-ietfrtgwg-ipfrr-spec-base-06. M. J. O Mahony, Results from the COST 239 project. 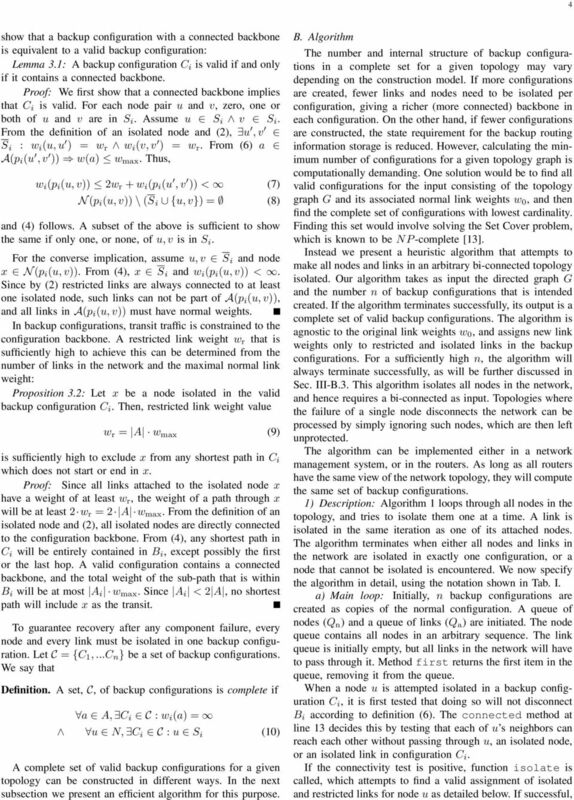 Ultra-high capacity optical transmission networks, in Proceedings of the 22nd European Conference on Optical Communication (ECOC 96), Sept. 1996, pp  B. Fortz and M. Thorup, Internet traffic engineering by optimizing OSPF weights. in Proceedings INFOCOM, 2000, pp  D. S. Johnson, Approximation algorithms for combinatorial problems, in Proc. of the 5. annual ACM symp. on Theory of computing, 1973, pp  A. Kvalbein, T. Čičić, and S. Gjessing, Post-failure routing performance with multiple routing configurations, in Proceedings INFOCOM, May  P. Pan, G. Swallow, and A. Atlas, Fast reroute extensions to RSVP-TE for LSP tunnels, RFC 4090, May  A. Raja and O. C. Ibe, A survey of IP and multiprotocol label switching fast reroute schemes, Computer Networks, vol. 51, no. 8, pp , jun  P. Narvaez, K.-Y. Siu, and H.-Y. Tzeng, Local restoration algorithms for link-state routing protocols, in Proceedings of IEEE International Conference on Computer Communications and Networks, Oct  Z. Zhong, S. Nelakuditi, Y. Yu, S. Lee, J. Wang, and C.-N. Chuah, Failure inferencing based fast rerouting for handling transient link and node failures, in Proceedings of IEEE Global Internet, Mar  M. Shand and S. Bryant, IP fast reroute framework, IETF Internet Draft (work in progress), June 2007, draft-ietf-rtgwg-ipfrr-framework- 07. R. Rabbat and K.-Y. 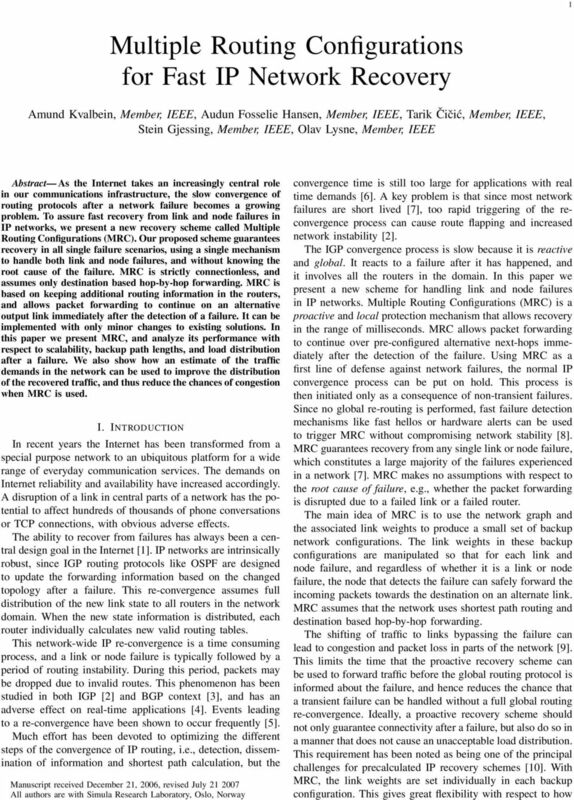 Siu, Restoration methods for traffic engineered networks for loop-free routing guarantees, in Proceedings of ICC, Helsinki, Finland, June  I. Theiss and O. Lysne, FRoots, a fault tolerant and topology agnostic routing technique,, IEEE Transactions on Parallel and Distributed Systems, vol. 17, no. 10, pp , Oct  A. F. Hansen, T. Čičić, S. Gjessing, A. Kvalbein, and O. Lysne, Resilient routing layers for recovery in packet networks, in Proceedings of International Conference on Dependable Systems and Networks (DSN), June  A. Kvalbein, A. F. Hansen, T. Čičić, S. Gjessing, and O. Lysne, Fast recovery from link failures using resilient routing layers, in Proceedings 10th IEEE Symposium on Computers and Communications (ISCC), June  Y. Wang, Z. Wang, and L. Zhang, Internet traffic engineering without full mesh overlaying, in Proceedings INFOCOM, Apr. 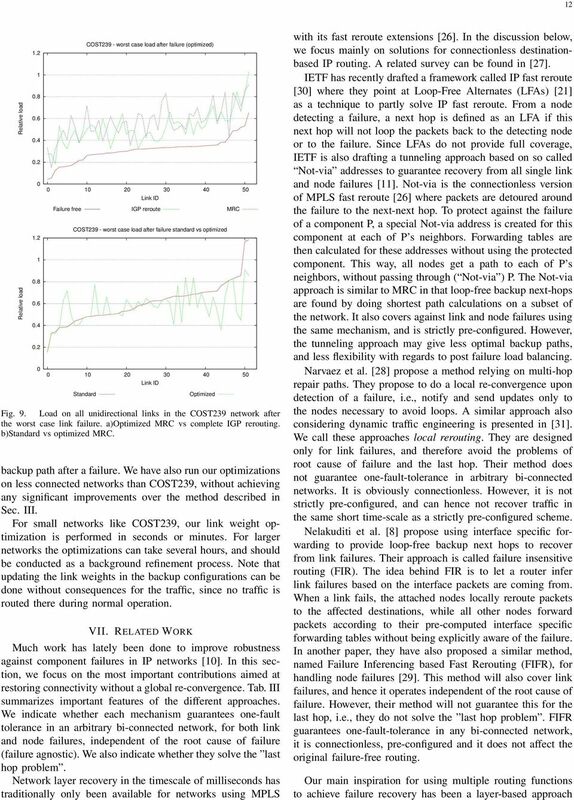 2001, pp  A. Sridharan, R. Guerin, and C. Diot, Achieving near-optimal traffic engineering solutions for current OSPF/IS-IS networks, IEEE/ACM Transactions on Networking, vol. 13, no. 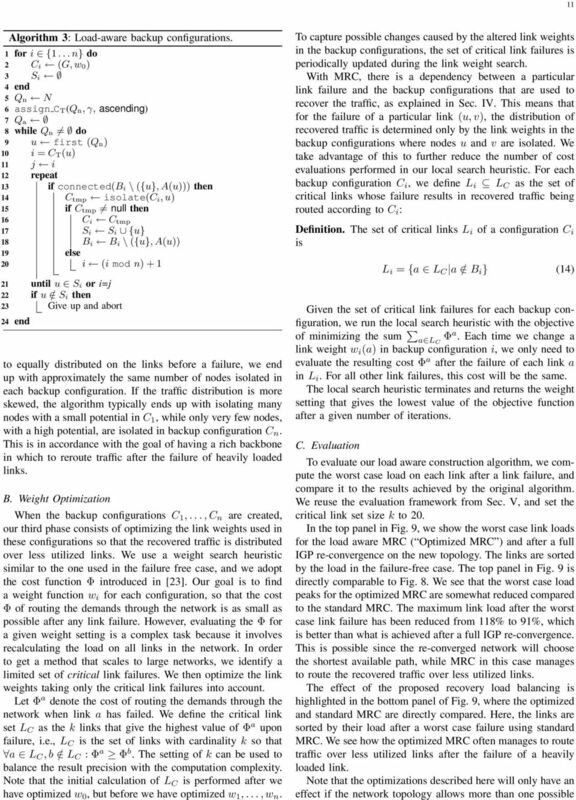 2, pp , Apr  A. Nucci, B. Schroeder, S. Bhattacharyya, N. Taft, and C. Diot, IGP Link Weight Assignment for Transient Link Failures, in 18th International Teletraffic Congress, Berlin, Germany, Aug  B. Fortz and M. Thorup, Robust optimization of OSPF/IS-IS weights, in INOC, Oct. 2003, pp  A. Sridharan and R. Guerin, Making IGP routing robust to link failures, in Proceedings of Networking, Waterloo, Canada, of the IEEE. Amund Kvalbein is a Post Doc at Simula Research Laboratory, Oslo, Norway, where he is leading a project on network resilience. He received his M.Sc. degree from the University of Oslo in 2003, and his Ph.D. degree from the same university in The main focus of his Ph.D. thesis is fast recovery mechanisms. His main research interests are network layer protocols, in particular issues related to fault tolerance, scalability and robustness under unexpected operational environments. Kvalbein is a member of the IEEE. Audun Fosselie Hansen received his M.Sc. degree from the University of Oslo in He is currently working towards his Ph.D. degree at Simula Research Laboratory, Oslo, Norway. His thesis deals with fast reroute in IP networks. He is also holding a part time position at Telenor R&I, Norway, and he has participated in several European projects. His main research interests are resilience in fixed and wireless IP networks, routing in heterogeneous wireless networks and media streaming to heterogeneous networks and mobile terminals. Hansen is member Tarik Čičić received the M.S. degree and the Ph.D. degree from the University of Oslo, Norway, in 1997 and 2002 respectively. He has been a postdoctoral fellow at Simula Research Laboratory, Norway, Today he is the CTO of Media Network Services, Norway, and associate professor at the Department of Informatics, University of Oslo. His research interests include network architectures, communication protocols modeling, network measurements, and network resilience. Dr. Čičić has been a member of the IEEE since 2000 and ACM since Stein Gjessing received his Dr. Philos. degree in 1985, and is currently a professor of Computer Science in Department of Informatics, University of Oslo, and an adjunct researcher at Simula Research Laboratory. Gjessings original work was in the field object oriented concurrent programming. He has worked with computer interconnects (Scalable Coherent Interface (IEEE Std. 1596) and LAN/MANs (Resilient Packet Ring (IEEE Std ). Gjessings main research interests are currently within network resilience, including sensor networks, Internet-like networks and optical networks. Olav Lysne is Research Director at Simula Research Laboratory, and professor in computer science at Simula Research Laboratory and the University of Oslo. He received the Masters degree in 1988 and Dr. Scient. degree in 1992, both at the University of Oslo. The early research contributions of Lysne were in the field of algebraic specification and term rewriting. However, his most important scientific contributions are in interconnection networks, focusing on problems like effective routing, fault tolerance and Quality of Service. In this area he has participated in numerous program committees, and he served as general chair of ICPP Lysne is a member of the IEEE. Routing Overlays and Virtualization Nick Feamster CS 7260 March 7, 2007 Today s Lecture Routing Overlays: Resilient Overlay Networks Motivation Basic Operation Problems: scaling, syncrhonization, etc.